Closed Loop Systems | Texland Petroleum, L.P. The City Council is also considering requiring the use of “closed-loop systems” in drilling operations. Under current rules, Operators may use earthen pits, either above grade or below grade depending on various factors, to store fluids used in drilling. A closed-loop system uses above-ground steel tanks for the management of drilling fluids instead of the typically used below-grade tanks or pits. 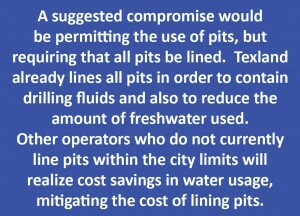 The State of Texas requires the use of plastic liners in drilling pits in some counties. Of note, liners are not currently required in Lubbock County. One of the major downsides to closed loop drilling is the associated truck traffic. For a typical horizontal well, Texland uses water hauled by approximately 62 trucks for drilling and fracturing purposes. After Texland is finished drilling, the water evaporates from the lined pits, acids and other chemicals are neutralized, and the remaining mud and cuttings are buried under the surface. When closed loop systems are used, Texland uses the same 62 trucks of water, but requires 40 additional trucks after drilling is complete to haul off water that would normally evaporate in a pit. In addition, 20 trucks are needed to haul off mud and cuttings that would normally be buried in place. The result is twice the traffic, twice the diesel truck emissions, and twice the wear and tear on local roads. Another disadvantage of the closed-loop system is that it adds anywhere from $250,000—$350,000 to the cost of drilling a well. In the case of the wells Texland operates in Lubbock County, this would reflect a cost increase of up to 40% for each well drilled. This makes many projects in Lubbock cost-prohibitive. This affects not only Texland, but also reduces revenues we pay to residents and local and county governments in royalties and ad valorem tax revenues. For all the additional expense, closed loop systems do not solve the problem of disposing of cuttings. Instead, it requires the hauling of cuttings and other waste products to another location. This results in additional truck traffic and raises concerns regarding the availability of proper disposal locations in the county. The real concern is not necessarily groundwater contamination, but rather topsoil contamination. There are many layers of caliche and other solid, impermeable rocks that protect groundwater sources from surface spills, but drilling fluids can contaminate the topsoil layer if they are not properly contained. In building its lined pits, Texland removes and stores the topsoil layer to create a large, sealed area that can handle a large volume of fluids, particularly in the event of a problem. The topsoil is returned upon the completion of operations. In the event of failure of the closed loop system, drilling fluids fall directly onto unlined, bare topsoil, potentially damaging many acres of land in the event of a spill.